In Uzbekistan, people with disabilities encounter many difficulties. Now, in the warm season, people with disabilities complain that they virtually have no recreation places to visit. What should be done to make all citizens of the country, regardless of their health status, have access to the urban recreation space? — According to official data, 650 thousand people with disabilities live in Uzbekistan, including 40 thousand in Tashkent (data as of January 2017), – Oibek Isakov, chair of the Association of People with Disabilities of Uzbekistan, said. – According to our data, there are a lot more people with special needs: 780 thousand in the country, including 70 thousand in the capital city (as of 2018). It’s clear that people with disabilities should have a barrier-free urban environment. We have relevant laws. So what is the problem? — We need to strengthen public enforcement of SNiP (construction standards and regulations), – chairman of the Association of People with Disabilities of Uzbekistan said. – According to republican standards, all buildings, crosswalks, park areas should be adapted for people with disabilities. But these standards are violated because there’s no proper public (from Ministry of Labour and prosecutor’s office) and social (from organisations of people with disabilities) enforcement. According to Oibek Isakov, there are fines for the violation of urban accessibility for people with disabilities, yet in the first half of 2018 less than one per cent of entities were fined. — Besides, according to the law “On social protection of people with disabilities in Uzbekistan”, all construction projects must be approved by public organisations of people with disabilities, – expert continued. – However, public organisations of people with disabilities don’ take part in the structural design and commissioning of facilities. Chairman of the Association of People with Disabilities of Uzbekistan quoted some figures: in Tashkent 3% of buildings are adapted for people with disabilities, and 2% in the country (in regional centres). Did the Association of People with Disabilities of Uzbekistan submit its complaints to responsible authorities concerning the violation of SNiP relating to the urban accessibility for people with disabilities? The Association of People with Disabilities of Uzbekistan several times applied to the Main Department of Architecture and Construction of Tashkent. But, unfortunately, the state designs and builds facilities without regard to the needs of people with disabilities. Private facilities are also built. According to Oibek Isakov, the Main Department of Architecture and Construction of Tashkent said they would take into account the legal requirements concerning the urban accessibility for people with disabilities, however, the situation has not changed. We made a request to Ministry of Construction and they promised to help; no one said “no”. What is the way out of the situation? The fact that people with disabilities rarely come out of their houses and don’t stand for their rights, – Dilmurad Yusupov. People with disabilities don’t go outdoors and don’t stand for their rights, – Dilmurad Yusupov, researcher. The expert suggested establishing community boards responsible for the accessibility of urban infrastructure to people with disabilities at the Ministry of Labour, Ministry of Construction, Main Department of Architecture and Construction of Tashkent. — These community boards would approve construction projects in the republic, monitor the compliance with SNiP, – chairman of the Association of People with Disabilities of Uzbekistan summarised. In Tashkent, there are private projects created for the useful activities of people with disabilities. But there are few such sites. One of such initiatives belongs to Anisa Shamsutdinova, trainer, organiser of the non-profit social and information project “Changing stereotypes. Sport for all”. A young woman, the mother of a son with Down syndrome, opened a group where she engages children with Down syndrome in sports activities, and holds competitions with them. Anisa is convinced that in Uzbekistan all children with Down syndrome should be able to attend sports groups for free and equally with healthy children. According to Anisa, in Tashkent there are no qualified trainers who are psychologically ready to deal with children with special needs, there are no sports grounds. Our society is practically not aware that such kids and adults need to communicate in the community. “It’s easier to think that we do not have children with disabilities because there is even no statistics – no data on the number of such children,” Anisa Shamsutdinova said bitterly. — A lot of money is spent to support health of a child with Down syndrome, Alfiya Latypova, the mother of 11-year-old Mirdanis, who visits Anisa’s group, said. – The disability allowance is not enough. For example, a course of neurological treatment of a child with our diagnosis costs in average one million sums (125 dollars). It’s bad that in our country there is no system of free sport groups for children with disabilities. I would like to have my son attend swimming pool because he has scoliosis after the heart surgery, but it’s very expensive. 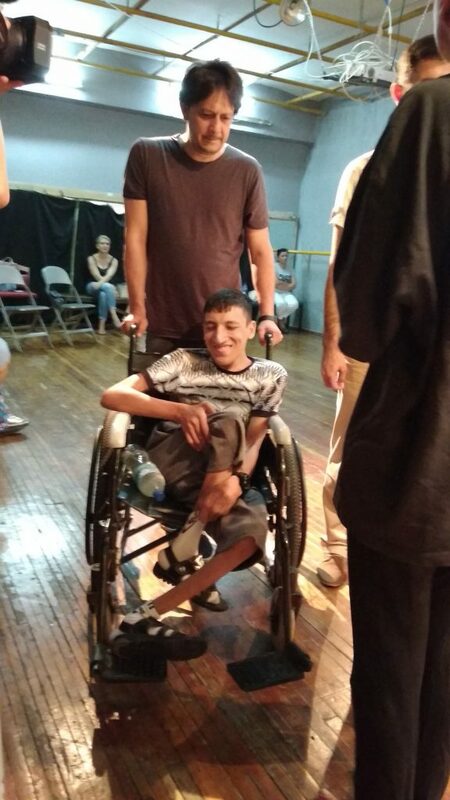 The Ilkhom city theatre has both children with disabilities and professional actors working on the same stage, they are the participants of the inclusive project. According to the artistic director of the theatre, Boris Gafurov, the group does various exercises, experiments once a week. The final stage will be in November, they plan to create a full course of theatrical inclusive project to be demonstrated on the stage of Ilkhom. — This creative laboratory is a new thing for us, – mother of Hodjiakbar, a participant of the inclusive theatre at Ilkhom, said. – In Tashkent, there are few projects for children with special needs. Here my son became a lively person, and in the past he was constrained. 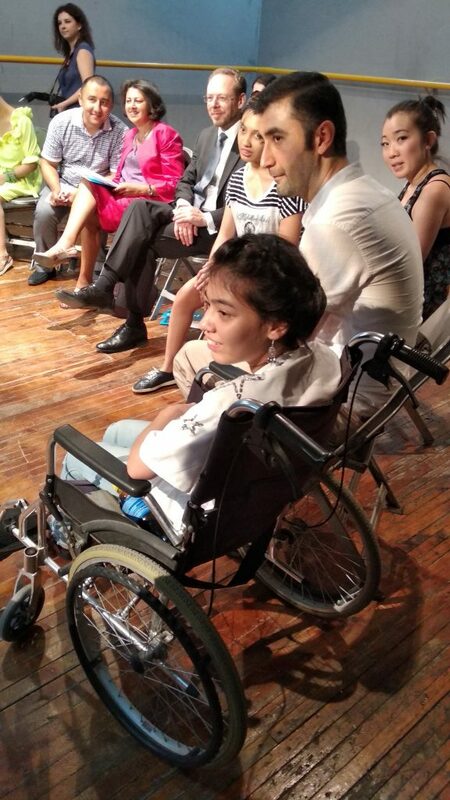 After a meeting with the artists of inclusive laboratory of Ilkhom theatre, the regional director of UNICEF in Europe and Central Asia, Afshan Khan, said that all people, regardless of their health status, have abilities, and the environment has to be created to make people with disabilities show their talents. Recently, Farkhad Artikbaev, a special-needs expert and famous in Tashkent father of son with autism, offered to equip one of capital parks for children with disabilities. They are not allowed to go on many rides in parks for their own safety. “But they want to go on rides, so they start crying because of that,” Farkhad explained. This special park would be open for anyone, according to the inclusion approach. People with various mental diseases have an acute reaction to loud sound, bright light, touches, strong smell, which is the main problem in organising the recreation activities in the city. According to Farkhad Artikbaev, public recreation areas should become comfortable for such people. For example, visual aids – pictures – as guides can be installed in parks. Because many people with mental illnesses don’t understand simple words or symbols. Recreation areas should be quiet, with low illumination. Farkhad complained that a quiet and peaceful botanical garden was in Tashkent, but now it is not quiet any more. — It would be great to make a small room in swimming pools and sport groups for people with mental illnesses, – the father of son with autism suggested. – After sport activities and crowds of people, sensory overload occurs in a person, and he can lie on a mat in this quiet room and recover. — My dream is to make these equipped areas for people with disabilities free of charge or preferential, – Farkhad Artikbaev said. 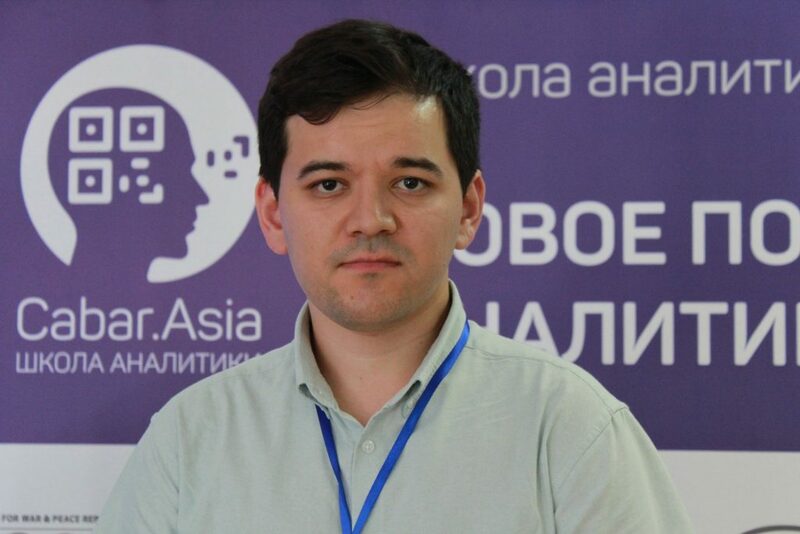 Dilmurad Yusupov, a PhD student of the Institute of Development Studies (IDS), University of Susses, United Kingdom, studies the problems of disability and inclusive development. According to the expert, creation of special barrier-free areas for people with disabilities is not quite an inclusive solution. — We need to adapt common park and recreational areas to the needs of people with disabilities, – Dilmurad said. – And prices in such areas should be adjusted for the socioeconomic status of people with special needs. In Uzbekistan, disability benefits fail to meet the basic needs of such people. For example, they spend much of their money to buy necessary drugs, aids. Transport is another significant expenditure item: taxi is too expensive, while public transport remains inaccessible for people with disabilities. According to preliminary results of the study held by Dilmurad Yusupov regarding the social inclusion of people with disabilities in Uzbekistan, many people wait for few years to get a voucher for a holiday centre or a health resort because they cannot afford to send their children to children’s camps. What do you think prevents Uzbekistan from creation of the barrier-free environment for people with disabilities? The fact that people with disabilities rarely come out of their houses and don’t stand for their rights. The laws are available only on paper, and they will become effective only when people with disabilities will start standing for the accessibility for themselves, including accessible recreation. Thus, according to experts and people with disabilities, Uzbekistan needs to design, build, reconstruct all urban facilities with regard to the needs of the people with disabilities to create a widespread barrier-free space. Public transport should be equipped with special aids: access ramps, special places for wheelchairs. And inclusion is very important.